Anglesey and North Wales are very close to Liverpool hearts. Countless Welsh builders helped create some of our inner suburbs in distinctive yellow brick, and the red bricks of the University are Welsh too. More recently, there can’t be many Scousers who haven’t had a day trip or two to Llandudno, Conwy or Beaumaris. 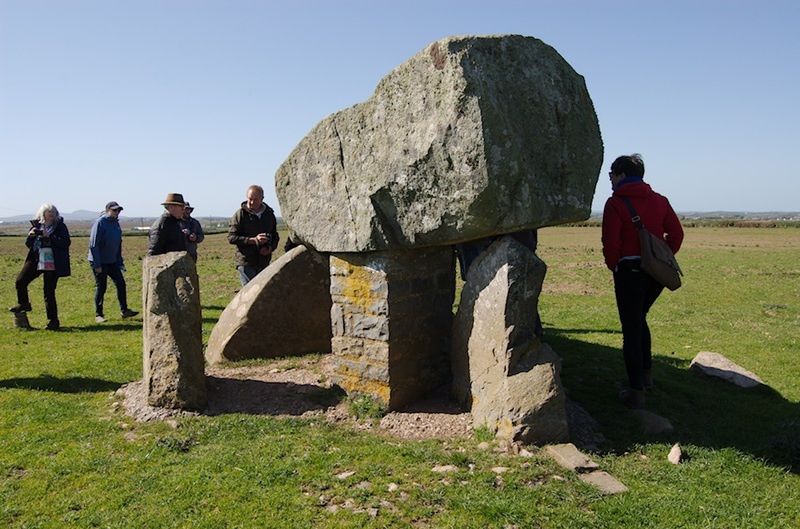 On the weekend of 13th to 15th May 2016 I joined a Neolithic Studies Group tour to Anglesey, or Ynys Môn, to have a look at much older remains of Wales’s inhabitants, and inevitably ponder on how old the links to Merseyside could be. You’re probably two steps ahead of me already, but I’ll catch up with you in good time. 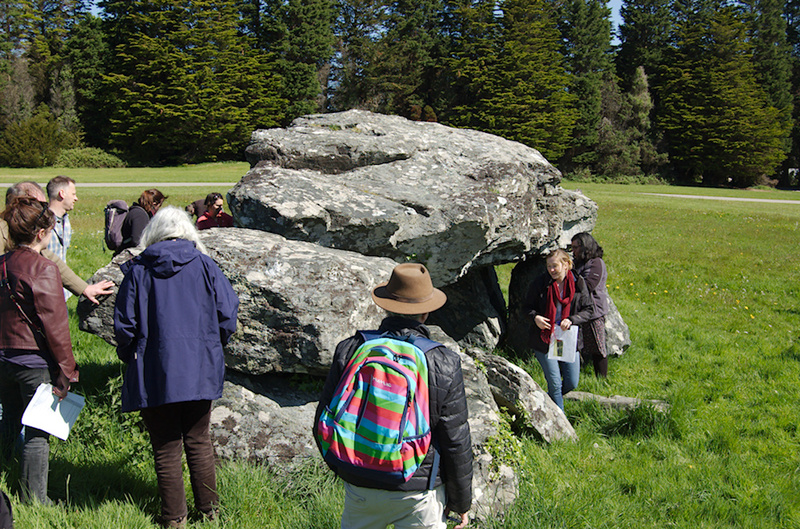 The Neolithic Studies Group meets once a year on similar trips, as well as smaller meetings at other times. It’s a loose collection of archaeologists interested in the Neolithic, but the range of people on this trip shows that you can’t group them much more succinctly than that. And then there’s me, who once was an archaeologist, and wrote two dissertations on Neolithic tombs in North Wales (one theoretical, one practical) about a decade ago. Despite not practising much archaeology for years, I couldn’t wait to get up to Môn and re-acquaint myself with some craggy friends who I’d last seen in about 2004. It turns out that some can change more than you’d think. We made the most of Twitter, the hashtag for the tour being #NSGAnglesey2016. There, you can see a ton of rocks, rock art, tea, cakes and scenery. Nobody can say the Neolithic Studies Group is stuck in the Stone Age. 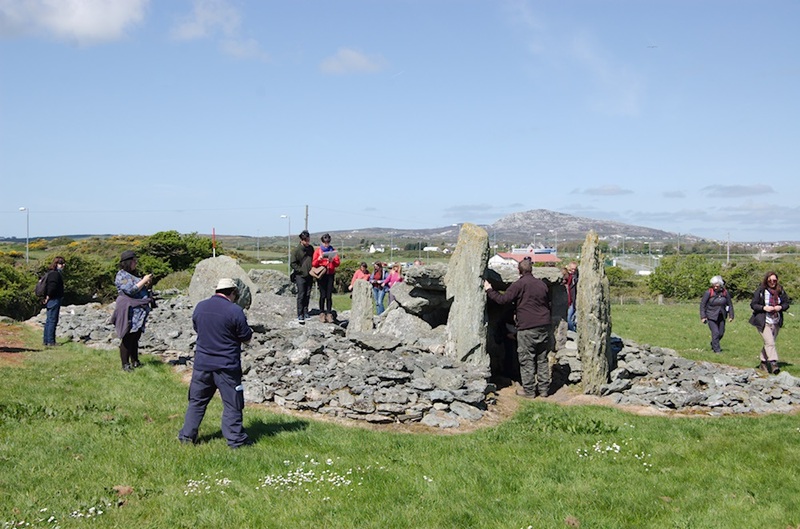 Seren Griffiths was our organiser, who pulled together two handy sheaves of notes on the tombs, and secured access to at least two tombs not normally open to the public. And there’s a lot more unglamorous tasks involved in making sure that the weekend went smoothly, such as organising food and herding us cats onto buses and into cars when necessary. On the topic of access, if you want to follow in our footsteps you’d better check first that the tomb is accessible to the public. Most you can get to along short paths from the road, and are well signposted, but I can’t be held responsible if irate wardens chase you off private land. Do your own due diligence! Finally, though I think this is the order we visited the tombs, the itinerary was changed to suit our timetable, so I may get it wrong here and there. Not really, of course. Beaumaris on a sunny Friday afternoon is a beautiful place, with views of Snowdonia (and perhaps Snowdon? ), which look like another world across the Menai Straits. It’s also got a satisfyingly ruinous castle, which nestles modestly at one end of town. But that was far too modern for our tastes this weekend, so a visit will have to wait. Having done a brief detour to the astonishing Portmeirion (of which maybe more in future) we checked in, had a two minute lie down, and then headed to the Bulkeley Hotel to meet up with the other trippers. Tiny monoliths of cheese, and cream cracker cairns were our sustenance, the cheese being local. The wine was less so, but we quickly settled into an introduction from Professor Tim Darvill, an NSG co-ordinator and Neolithic specialist, who gave the floor to Frances Lynch. Frances literally wrote the book on Prehistoric Anglesey, as well as contributing to Prehistoric Wales and many other papers and books. She was easily the author I relied on most during the writing of my undergraduate dissertation, so it was brilliant to see her in person, holding the audience with her detailed yet good-humoured overview of the tombs we would be seeing (and more). She’d excavated some herself, and knew the material inside out. It’s also the first time in a while that I’ve sat through a talk with actual slides, and a vintage slide projector which is probably archaeological in its own right. You can get a little taster of this from one or two tweets which went out that evening. Our archaeological and physical appetites whetted by the evening, we managed to find a late-night eatery and ponder what was in store for us in the morning. Saturday dawned sunny but chilly, and we piled into a minibus headed for Plas Newydd, a National Trust property focused on an 18th century house. But we paid that no attention, heading towards the gothic stable block and cricket pitch where our first tomb stood waiting. This is a tomb I’d only been able to see across a fence and field when I popped by as an undergraduate, so I was thrilled to get up close. Kathy Laws, the National Trust’s own archaeologist for the region (and what a region to cover!) gave us an overview of the tomb’s history, while Penelope Foreman debuted a home-made device which reads the colour of the rock which makes up the tomb. For those like me who are fascinated by the details of these gadgets, it was based on an Arduino board with a sensor giving out RGB (red/green/blue) values which Penelope noted down for a growing spreadsheet. A future version of the device (already tastefully presented in a Ferrero Rocher box) should be able to log the colours itself. I gradually became fascinated by the myths surrounding the tombs, particularly the origin myths often reflected in the name. Bryn yr Hen Bobl literally translates as ‘Hill of the Old People’. Whether these ‘old people’ are people in the ancient past or pensioners I’m unsure, but either way it attributes some kind of history to the place, of which I’d find more later. 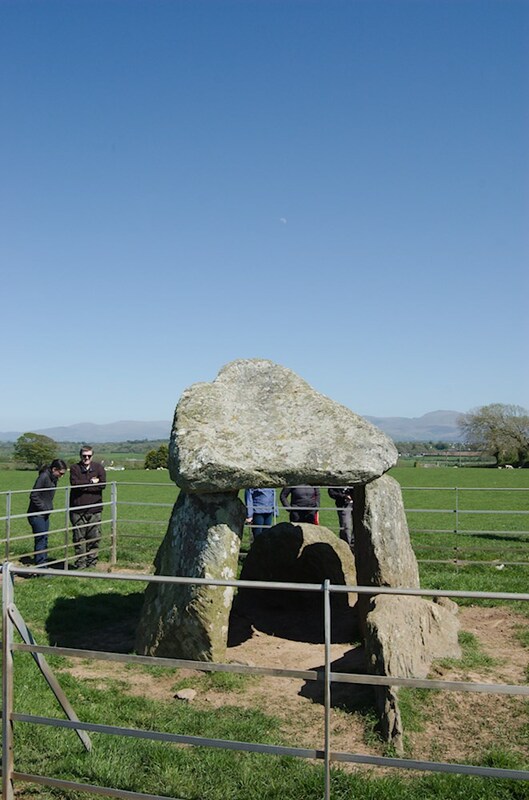 Bryn yr Hen Bobl: The tomb is unusual in that it has a long arm projecting out of the east side (the far side in the above photo). Researchers have suggested that this was built to match a natural ridge on the west side, but the idea is still debated. I myself could see that there was such a ridge, but I think its age is unknown as yet. If you’re keeping up with your Welsh here, then you might know that this is also a ‘Hill of…’. In this case it’s ‘in the dark grove’. Well, there’s some landscape history for you, as the rapidly warming sunshine on this exposed rise is as far from a dark grove as you could imagine. At one time it must have been a little more hidden in woodland. 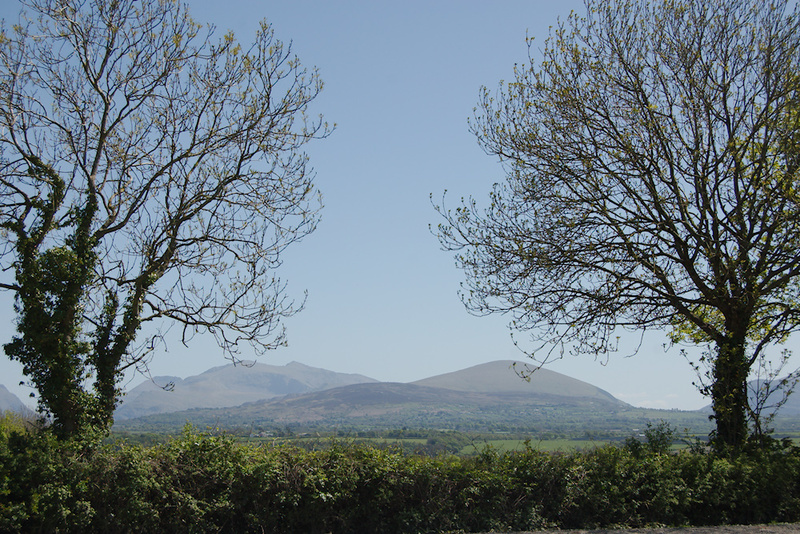 Frances Lynch’s Anglesey book mentions that trees were once a more prominent feature of the island, but whether that theory is still current is up for debate. 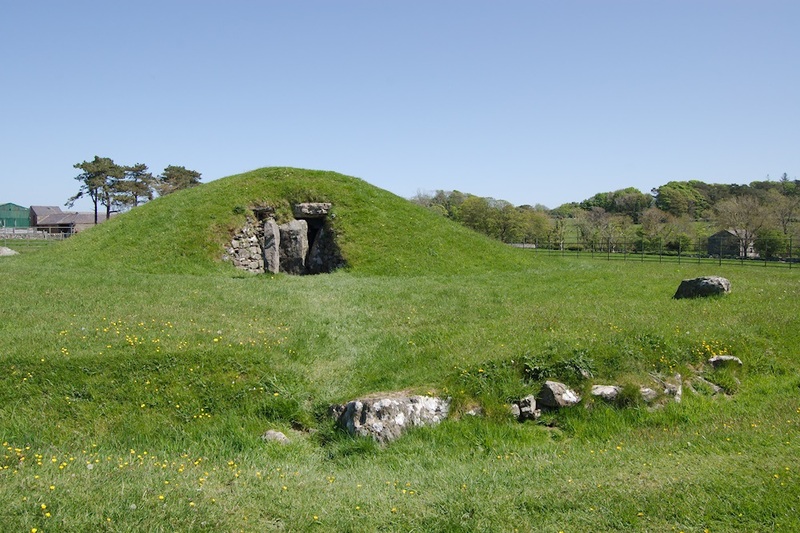 But the most important aspect of Bryn Celli Ddu for readers of this blog is that it’s the tomb most often cited as being a parallel with the Calderstones in Allerton, before the mound that covered those stones was destroyed in the 19th century (and possibly robbed before that). 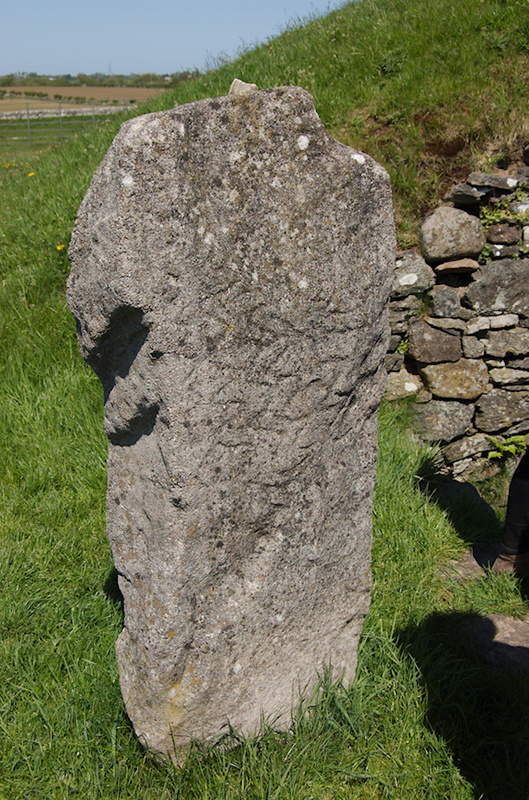 Part of the parallels lie in the arrangement of the stones making up the chamber and passage, but an additional aspect is the pecked lines and patterns carved on the stones. One monolith stands (possibly erroneously) outside the ‘back door’ of the tomb. This is a replica of the original so-called ‘Pattern Stone’, which is in the National Museum of Wales in Cardiff, and stands where it is originally thought to have done so. The ‘back door’, and the outside location of the Pattern Stone, are both the result of the rebuilding of the mound in the 20th century, which created a smaller hill than would have been in the original. Another fascinating element of the site is that the tomb was built over an older henge monument, and excavation found an oval arrangement of stones, matching pairs. The Pattern Stone may have stood in the centre of this henge, explaining why the patterns cover both sides (which would have made less sense if the stone was only ever part of a tomb wall). Finally, the central chamber has a monolith within it, which is oddly smooth and circular in section. It may be a petrified tree, as evidence of shaping with tools is not obvious. The tomb and passage are aligned with the midsummer sunrise too, and so the rays of the rising sun on June 21st shine on the back of the chamber’s interior. I wonder whether the Calderstones were once like this? What a thing to have had in Liverpool’s suburbs if the Calderstones mound had survived intact! The group generally agreed that the information boards in the car park and around the site were a little ambiguous, with atmospheric illustrations yet little concrete information on the uses and history of this complex monument. Brilliantly, lunch was pre-ordered and waiting for us at Hooton’s Farm Shop (beef and horseradish sandwiches recommended). After we’d stuffed our faces and considered the purchase of 7 pound packets of sea salt, Cat Rees gave us a talk on excavations of Neolithic houses at Llanfaethlu. There are three buildings there, though it’s not yet been established if they were ever in use at the same time, or one at a time, or something else. Nevertheless, Neolithic domestic archaeology is a rare thing, and these excavations go to show how our knowledge of this period is contantly changing, and our methods improving. Next on our journey was Bodowyr. 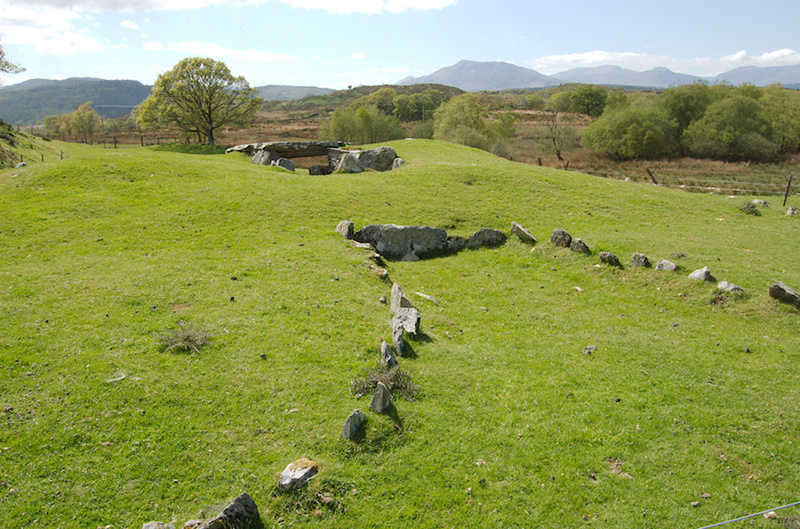 This tomb can be seen from the road, and sits in the middle of a field of nervous sheep. We often ask ourselves about the ‘landscape context’ of a tomb, and whatever the thoughts of the original builders, the views to the Welsh mountains were almost as good as that in Beaumaris. It’s under the protection of CADW, part of the Welsh government, and is surrounded by a fence. The capstone is a huge mushroom shaped affair, and sits precariously atop three other stones, with two more stones sitting on the ground. We had to skip Din Dryfol, as time was tight. This was a shame as the site is hard to find, and on my 2004 visit I wasn’t sure I’d got to the right place! Instead we headed straight to Ty Newydd, which was a classy little number that I’d also visited before, though I’d forgotten about the beautiful brick columns which now hold the capstone in place! Got to admire the pointing, though. 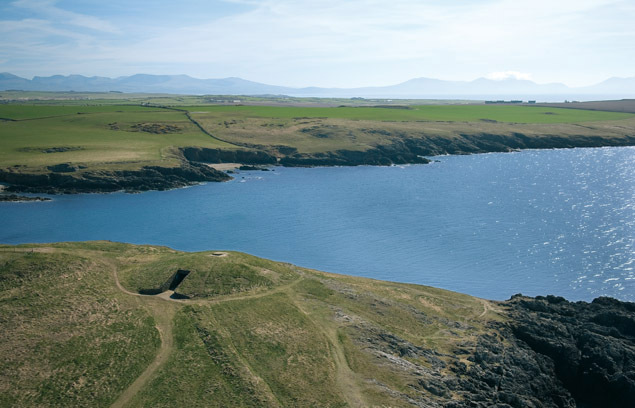 Another name to conjure thoughts of mythical beginnings, Barclodiad y Gawres means the ‘giantess’s apronful [of stones]’, evoking a frustrated woman casting a pile of rocks which she was carrying, them landing upon a spectacular cliff-top on the western coast of Môn. 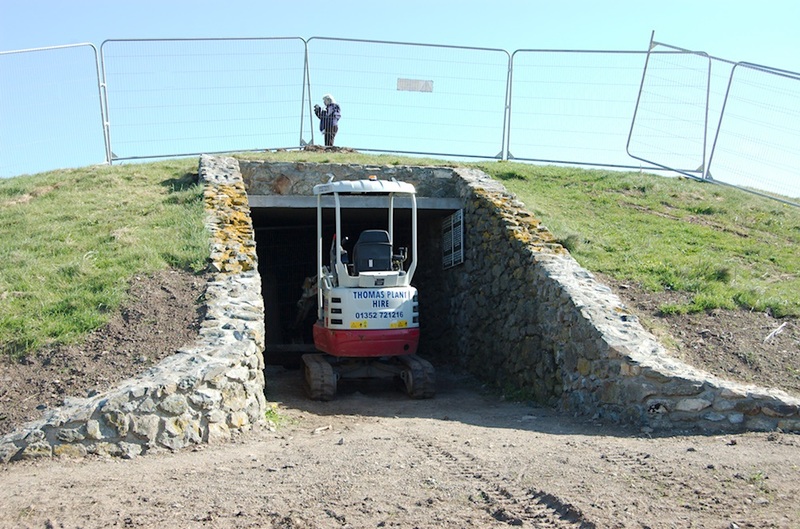 The frustration was all ours, however, as this jewel in Anglesey’s crown is currently being refurbished and re-presented by CADW, and is currently closed to all! It’s another tomb with carved/pecked artwork in, evoking parallels with the Irish tombs like Newgrange and others in the Boyne Valley. Indeed, you can see the Wicklow Mountains on a very clear day, and it’s a reminder that the Irish Sea was far from a barrier to Neolithic people – it was a great route to contact other communities from Ireland, Scotland and the Lancashire and Welsh coasts. So we were restricted to looking through a fence at the cleaned-up entrance, and standing on its summit to take in the views of Cable Bay (where the Atlantic telegraph makes landfall) and the surrounding green hills. However, our bonus was a visit from Rhys Mwyn, an archaeologist and musician who has recently published a Welsh-language book about North Wales archaeology – the first of its kind apparently! He told us of the plans to make the site more accessible, and of one-day events which take place now to promote Welsh prehistory. People come from afar afield as Yorkshire and Gloucestershire on these days just to look at the one tomb! I’m not surprised, as recalling my previous visit during my dissertation research it would be well worth it. I’m looking forward to seeing what CADW do with it, and to coming back in the future. Saturday night was an opportunity to chat about the day over a curry and beer, before retiring to take over the Liverpool Arms in Beaumaris. Amazingly, the sun shone for us all day again as we assembled outside the Bulkeley Hotel once more. This time we formed a convoy of cars, allowing people to peel off to go home when necessary, as some had come from far afield. The first stop was at Trefignath. 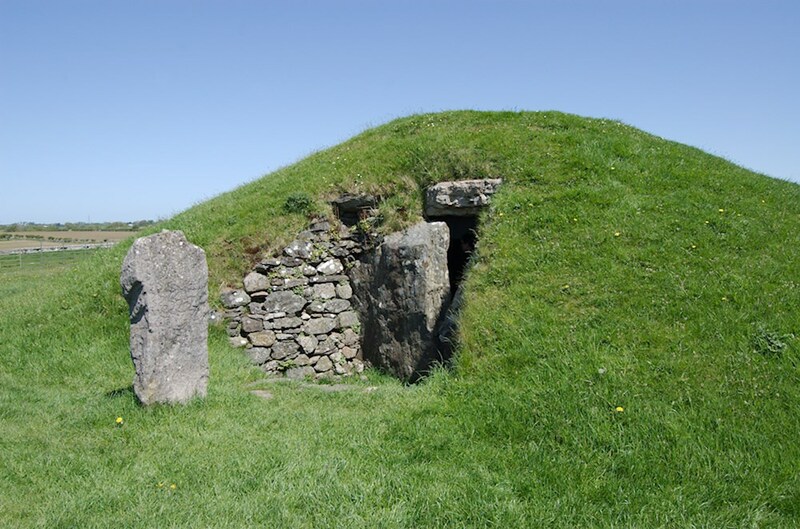 Trefignath is an evasive tomb. The Neolithic builders clearly sought to hide it away from the road in the shadow of an aluminium smelting facility. However, GPS came to our rescue and we were soon standing on a rocky outcrop which had become the home of a multi-phase mound. Although the mound itself is no longer in existence, many of the stones which made it up were still there (or rather replaced by excavators) and this exposed skeleton gave us a great view of the entrance walls of early phrases, subsequently overtaken by later mound phases. Referring once more to archaeological drawings, it eventually became clear that the central chamber had collapsed since it had been recorded in the 1980s. This highlights the ever-evolving shape of these remains, and the importance of constantly renewing the protection of them. Good luck to CADW at Barclodiad! Another significant drawing is that made by the antiquarian John Aubrey, who sketched Trefignath in the 18th century after a supposed visit. I’m no expert on the manner in which tombs collapse, but I very much doubt that Aubrey had anything more than a six word description to go on when making this sketch. You cheeky git, you. My final tomb of the day, at least as part of the tour, was Presaddfed, far inland (for Anglesey, anyway). It’s another two-chambered tomb, although one is much better preserved than the other. Reports of a number of small stones surrounding the two chamber remains suggests that a single mound once covered both, but there’s no evidence of that any longer. There’s also a story that the better-preserved chamber was actually occupied by a family in the 18th century. Whether they supplemented the meagre shelter with walls is unknown, but it’s certainly an evocative place to live! At this point we said our thanks and goodbyes, though many new connections have been made. The rest of the group went on to lunch, and a couple of other sites (including – gasp! – an Iron Age settlement) in the afternoon. Sue and I then began our long journey home, taking in the spectacular route across Snowdonia and stopping off at a bonus tomb, Capel Garmon, which in shape more closely resembled the so-called Cotswold-Severn group of southern England. I’m still buzzing from all the excitement of the tour, and am so glad to have been able to get back to Anglesey after more than a decade. I’ve found a score of people to follow on Twitter, and keep up to date with their researches. As I mentioned, a big thread for me running through the weekend was the Irish Sea links between north Wales, Ireland, southern Scotland, the Isle of Man and Lancashire. 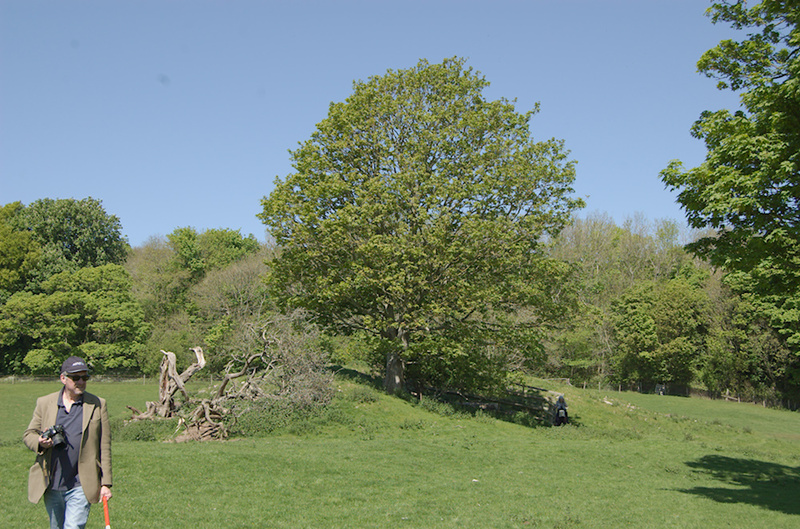 The Calderstones were mentioned more than once, which shows how well known that site is outside of Merseyside. 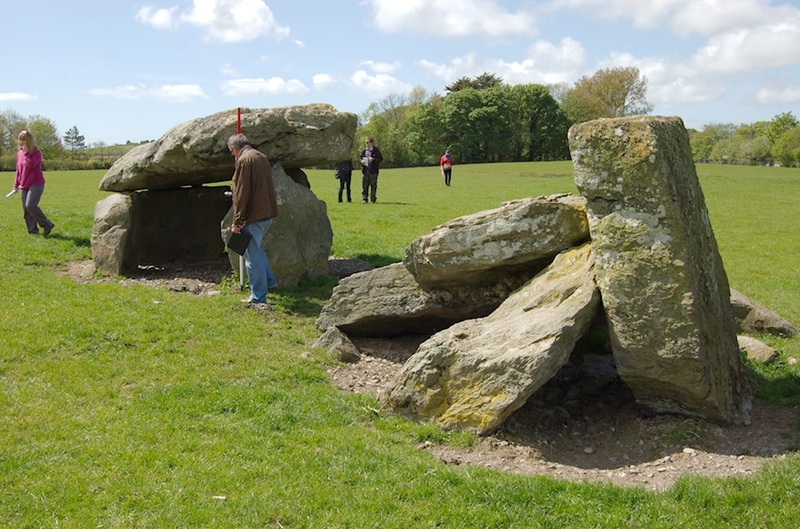 Anglesey, because it’s still very rural, is lucky enough to have seen relatively good preservation of so many tombs. But the question I’d like to ask is: would Liverpool and south Lancashire once have had the richness of remains if urban development had not taken off? We know from the famous Allerton map of 1568 that there were likely other prehistoric remains in the area, and it’s accepted that our distribution maps of tombs and the like is more an accident of preservation and research than something related to the original distribution. It’s a question we’ll probably never know the answer to, at least until Stephen Hawking invents that time machine. The only thing left to say is another thank you to Seren for organising the trip, Ben Edwards for driving the minibus with such panache, Rhys and Kathy for coming along and talking to us, the National Trust and Marquis of Anglesey for giving access and Frances Lynch for giving Friday’s introductory talk. I was so sad to see what was happening to the mound. As a child some 60 years ago I crawled in to the tomb with my Great Uncle. The joy at seeing the stone markings,and bit on the floor. I still have the photographs he took there. When we went back a few years ago it had already lost some of it’s atmosphere so I hope they will not lose it completely with the changes.